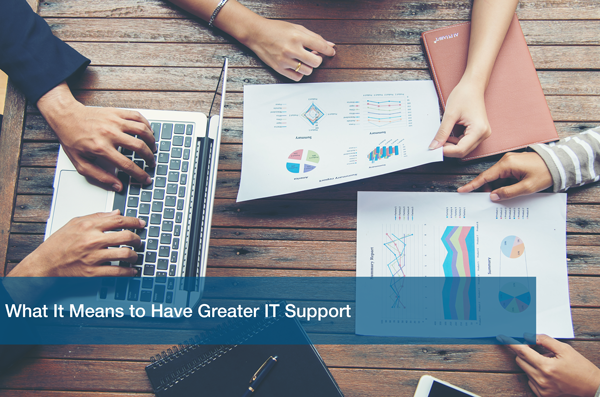 You hear the words “IT support” thrown around a lot in the small business community, but what exactly do they mean? Having IT support means always having someone there to fix all your technical issues. Preventative care is the main difference between IT support and greater IT support. Every business we talk to has a “break-fix” strategy. Something breaks, it gets fixed. Nothing more. What if it breaks again? They fix it again. What if you could stop the problem from “breaking” in the first place? Preventative care is not a foreign topic. Think of your health insurance. You invest in it because you never know what can happen. You want to be protected no matter what. Why shouldn’t your business get the same treatment? What if we told you-you don’t have to worry about your IT problems? Our preventative care protects your data and keeps you secure from online threats. We monitor your systems 24/7 and alert you if problems arise right away. Don’t shell out cash each time something breaks. Invest in an IT service provider up front and stop worrying about your IT. Sounds like a solid plan right? Like we mentioned above, having a “break-fix” strategy really adds up in the long run. Paying for IT support each time something breaks can be costly. If the issue is never truly fixed, then you’ll keep paying for in-the-moment solutions. What if instead, you paid someone to improve your technology so nothing breaks in the first place? We work with your business to ensure what you are paying for is exactly what your business needs. No overpaying, no millions of dollars spent on temporary solutions. Every business is different. Not just in industry, but in how they run. So why would you adopt IT strategies that other businesses are using? We can help create a strategy that works specifically for your business. We work with your team by consulting you on the best technology out there that can take your business to the next level. With just a 15 minute IT-Analysis, we can tell you exactly what areas of your IT need improvement. Then we formulate a plan with you to take care of those improvements. No hassle, no complications. Does this sound like a dream? It’s not, with ITC as your trusted IT partner. We work with your business to ensure you have the best IT support in Austin. If you’re ready to take the first step to greater IT, sign up for our Free IT Analysis. Valued at $599, our small business consultants will meet with you to show you just how much your business can grow with ITC. Start your journey today to greater IT support!